Stop Loss Tracking just got a whole lot Easier! Avoid catastrophic losses by sticking to your trailing stops. StopLossTracker is a simple tool specifically designed for managing your trailing stops outside of your brokerage account. StopLossTracker can monitor all of your stocks and notify you via text and/or email to let you know if your stop loss has been hit. Track stocks from all over the world, including indexes, mutual funds, and over 50 exchanges. As your positions reach new highs, your stops rise as well, ensuring you lock in gains. Stops and purchase prices are adjusted with dividends and splits. When your position closes below your trailing stop price, receive an email notification by 6pm EST. Track your stops from your mobile device and your experience is seamless. Receive a weekly digest giving you a quick overview of which positions are most at risk. Easily determine how close you are to hitting your trailing stop price by checking out the stop loss bar. Green means you are good and probably reaching new highs, while red means you are close to selling. Maybe you have a Roth IRA at Fidelity, and a speculation account at TD Ameritrade. 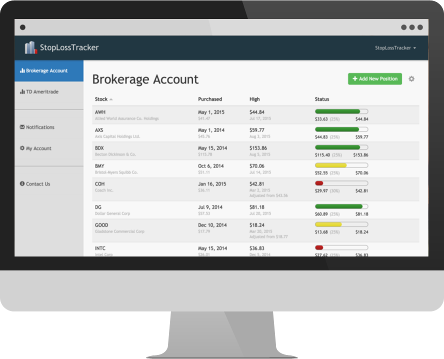 With StopLossTracker you can easily setup and track positions from multiple accounts. Requires paid subscription. Each week you will receive an email that shows each of your positions, and where they are relative to the trailing stop price. Your riskiest positions are listed first, so you can quickly see your status. I love the StopLossTracker site due to the usefulness of moving stop prices without intervention. The site allows you to keep track of pretty much any stock, and I love the weekly report. I would recommend StopLossTracker to anyone with a busy schedule that would like to monitor their positions. Who is keeping an eye on your stocks today? Quickly see how your investment has performed overall. The ROI calculation includes any dividends that have been paid while you have been holding the stock, which is a much better indicator of performance than just the nominal stock price change you get from your broker. Each position has a custom chart to allow you visualize the price and trailing stop loss as it has changed since your purchase date. When tracking a short position, you make money when the price goes down, so your High Price is actually the stock’s lowest closing price, and your stop is reached if the stock rises by your stop percentage. Your stop loss status bar will be inverted to show the price change that will trigger the stop. I was always worried about losing a considerable portion of my investment due to downward action of the markets. I was looking for a way to have a program keep track of losses and to notify me if it occurred, thereby saving me worry, substantial losses and grief. Account managers and brokers do not provide this service. The answer is StopLossTracker. It is very easy to use and does the job perfectly. Select from over 100,000 stocks across more than 50 exchanges, including indexes and mutual funds. Each day after market close, we analyze all your positions’ closing prices to determine if you reached your stop price. Choose when you purchased and how far below the High Price you want to sell your position. Your stop will be adjusted with splits and dividends. When your position closes below the stop price, you’ll be notified that it is time to sell. You will also receive a weekly summary of your positions. No credit card necessary to start your 30-day trial. Trailing stop losses are a simple way to avoid catastrophic losses, lock in gains, and let your winners ride. Take the emotion out of your investments, and never chase a position on the way down again. 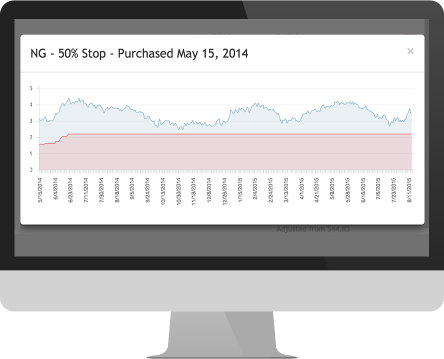 StopLossTracker makes tracking your trade stops simple.